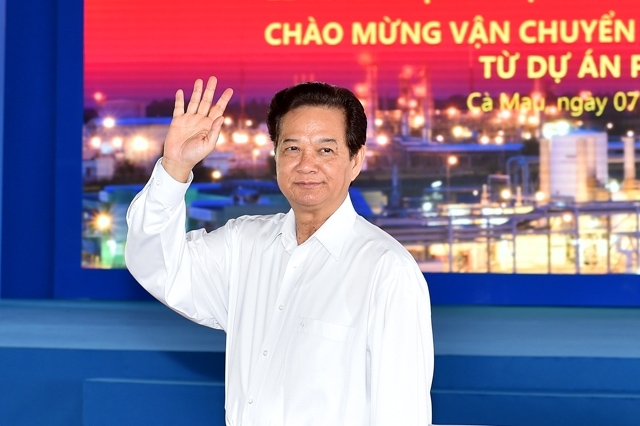 On February 7 morning, the Prime Minister Nguyen Tan Dung arrived Ca Mau Gas - Power- Fertilizer Industry Zone (Khanh An commune, U Minh Dist., Ca Mau province) for attending the ceremony for starting the construction of Ca Mau Gas Processing Project and welcoming the safe transportation of 10 billion cubic meters of gas from PM3-CAA to Ca Mau. The Prime Minister Nguyen Tan Dung attending the ceremony for starting the construction of Ca Mau Gas Processing Project and welcoming the safe transportation of 10 billion cubic meters of gas from PM3-CAA to Ca Mau. The Ca Mau Gas Processing Project (GPP) includes a 37 kilometer offshore additional gas pipeline for increasing transportation with a capacity of the current PM3-Ca Mau gas pipeline from 5.8 million m3 per day to 6.95 million m3 per day in order to meet the need of consumers in Ca Mau Gas-Power-Fertilizer, a 6.2 million m3 per day gas processing plant, a storage system for storing a LPG 8000 ton volume, a condensate 3000 m3 volume and a port system for exporting liquid products in Khanh An Industrial Zone. According to PetroVietnam, developing the project will: help to balance the gas supply and demand in Southwest region, diversify the high valued petroleum products to meet the need of LPG and petrochemical products in Ca Mau province, Southwest region particularly and in the country generally; and at the same time, take part in ensuring the national energy security and create the jobs for local labors and increase the state budget. 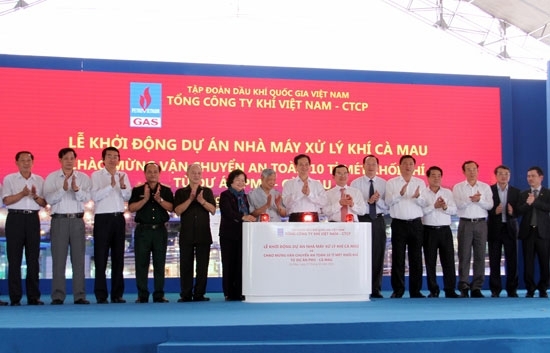 Along with starting construction of Ca Mau GPP, PV Gas Corporation also held a ceremony for welcoming the safe transportation of 10 billion cubic meters of gas from PM3-CAA to Ca Mau. PM3 - Ca Mau gas pipeline is a part of the Ca Mau Gas - Power - Fertilizer area with a capacity of 5.47 million m3 per day, equivalent to 2 billion m3 per year and a total investment of nearly $ 300 million. Speaking at the ceremony, Prime Minister Nguyen Tan Dung praised and high appreciated PetroVietnam and PetroVietnam Gas Corporation to overcome all the difficulties for safe transporting 10 billion m3 of gas from PM3-CAA to Ca Mau and, at the same time, exert all their strength to start the construction of Ca Mau GPP, that marks a new step of our petroleum industry development. The Prime Minister stressed, the Ca Mau GPP will be able to make an about VND 5000 billion turnover per year and contribute to promoting socio-economic development in region particularly and in the country generally.